Dynacom kits are legendary for their strength and high level of design. 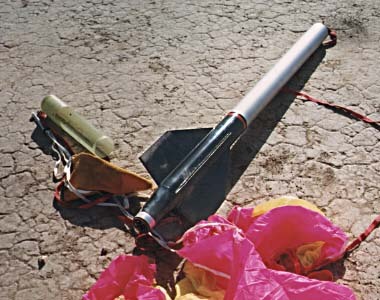 These all-fiberglass and metal kits are the pinnacle of kit-built rocketry. Unfortunately, by the time I was ready to try them in the summary of 1998, Dynacom had temporarily stopped taking orders due to family medical problems. But by the end of the year, they had resumed business and I ordered my first kit, the Python. 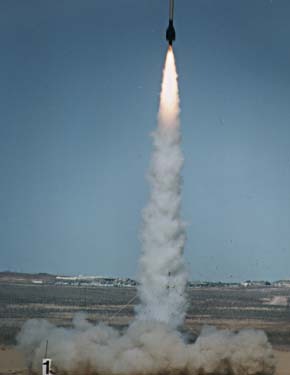 The name "Python" is very suggestive and a standard rocket body is reasonably snake-like. Unfortunately, the snake pattern is quite detailed with all the different colors and the scale pattern. Painting this rocket like the snake was going to be quite a trick! Instead, I decided to paint it like the gun (Colt's Python is a fancy .357 magnum revolver). Solid colors are so much easier! But you can see that it's indeed a sleek rocket, even if not quite snake-like. 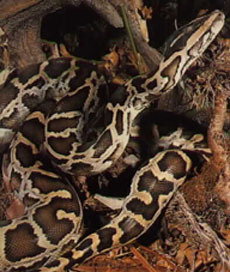 The Python flew for the first time at Springfest '99 on March 21st. I wanted a serious 54mm motor, so I chose the single-use AeroTech K1050 (full K and only 2.5s burn). 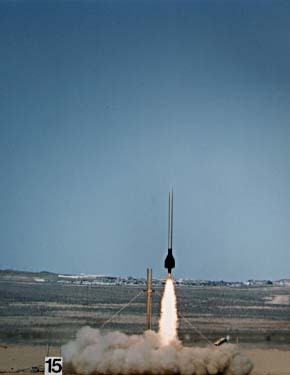 Of course, this rocket took right off as the motor came up to full power (300#) immediately and streaked off into the sky (and out of the picture). Unfortunately, the Python didn't make it back intact, despite a beautiful boost. Either during boost or landing, a fin came off. I suspect that this happened during boost, since the fin seems to be torn out and was not found with the rest of the rocket. However, I would have thought that losing a fin during boost would be a sure shred. 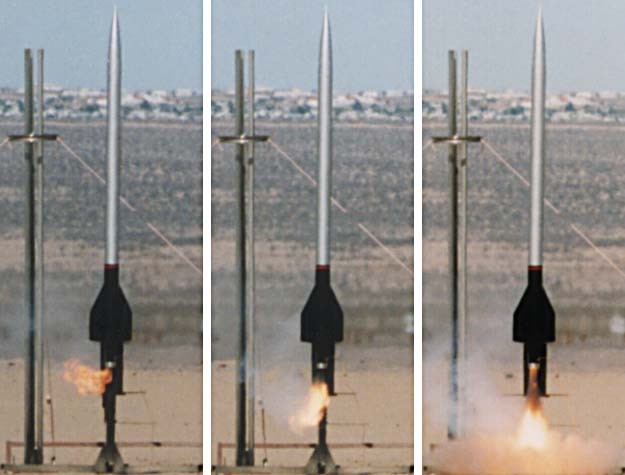 Anyway, you can see in the picture below how the top-left fin is missing, leaving on the ragged fin slot (this was a four-finned rocket). Of course, I had to wait almost three months to get it (good thing I had other projects in the works), but these rockets are definitely with the wait. 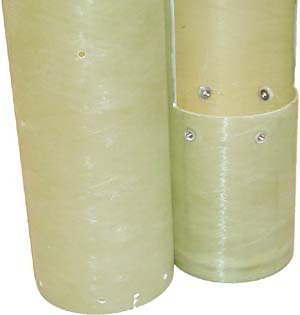 There are no wood or plastic parts in the kit; just fiberglass and aircraft aluminum. The instructions are simple and straight-forward and kit construction should present no problems to the experienced high power kit builder. Speaking of instructions, I scanned them in for those who want to reproduce this kit now that Dynacom is long gone: Dynacon Python instructions. Here's the business end of the rocket with all but one fin installed. Note that aft end of the rocket is a metal ring with a built-in motor retainer. The ring has a groove machined into it and a snap ring fits into it after the motor is slid into place, providing positive motor retention and then some. All body parts are made out of wound G-10 fiberglass the the fins are G-10 sheet. The edges of the fins come pre-beveled and every part is precision fit. In a way, this kit builds too easily. I built up the airframe in only about 5 hours elapsed, which was a little too quick. Oh well, I can probably spend that much time painting it alone. On the right you can see the payload section/electronics bay. 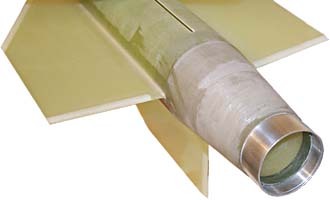 The electronics bay tube fits inside the payload airframe section and has half the tube missing for most of the length. This allows a plate to be inserted to hold a bunch of electronics. To maintain the integrity of the rest of the airframe, I decided to use G-10 sheet for the electronics plate. You can also see the bolts which are the way the Dynacom kits are held together. Hex head screws thread into the bolts on the inside of the airframe and are backed out into matching holes in the outer airframe to hold the sections together. A very neat and precise system! The kit comes with no recovery system at all. A double steel cable is mounted through the forward centering ring for recovery system attachment but no other provisions are made.